In 2008, Barack Obama was elected President of the United States in no small part because of the compelling possibility that this biracial harbinger of hope and change would finally bring America into an epoch of post-racial unity. But over seven years later, America is on the verge of a race war. Particularly since August 2014, from the shooting of black suspect Michael Brown by white officer Darren Wilson in Ferguson to the rise of the Black Lives Matter movement which has wedged its way into national prominence, racial unrest in this country under Obama’s reign has gone from a tense simmer to a churning boil. The left want to pin this ugly decline on what they perceive to be the right’s racist refusal to accept a black man as President; but in fact, it is left’s own corrosive, inherently racist, identity politics, spearheaded by Obama himself, that has exacerbated rather than healed our racial divide. 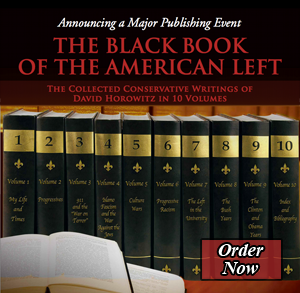 Progressive Racism, the sixth, just-published volume of The Black Book of the American Left, looks at a wide range of David Horowitz’s thoughts on the topic over the course of the last twenty years. Divided into five parts – “The Reds and the Blacks,” on the Marxist roots of progressive racism; “Decline and Fall of the Civil Rights Movement”; “Racial Correctness”; “Reparations for Slavery”; and “Progressive Racism” – the nearly fifty essays in this book expose leftist hypocrisy about race and dismantle the false narrative that the left is fighting for justice and equality against an irredeemably racist right, the guardians of a supposedly systemic white supremacism in America. In subsequent sections of the book, Horowitz chronicles the degradation of Martin Luther King, Jr.’s civil rights vision into “civil wrongs.” “Progressives support racial division,” reads the title of one piece. In another essay, Horowitz points out that liberals don’t want racial dialogue; they want a racial monologue, in which blacks “express displeasure at a status quo that denies them equality” and whites simply acknowledge their racist guilt. Hate crimes can be multicultural too, Horowitz writes in another piece. Progressive Racism includes a couple of essays some might find surprising: Horowitz’s controversial essay “Second Thoughts About Trayvon,” for example, in which he sets himself against general conservative opinion about the shooting of black Florida teen Trayvon Martin by “white Hispanic” George Zimmerman, who ultimately was judged to have acted in self-defense. “Is the Zimmerman case really open-and-shut?” Horowitz begins. He goes on to question whether the incident was quite so black-and-white, so to speak, as both the left and the right viewed it: “Might it not be possible that the toxicity of the racial environment also infected Zimmerman, so that he saw in Trayvon a caricature” from the racial and political melodrama surrounding the incendiary case? In a free society, composed of individuals who are unequal by nature, the highest government good is neutrality in the treatment of its citizens before the law. One standard and justice for all. This is the only equality that is not at odds with individual freedom.